Sound "Near edge-of-the-art resolution and dynamics, seamless coherency, along with extension at the frequency extremes"; high resolving power that displays good and bad from source material and upstream components; not the soundstage "bloom" of some other speakers. Features Aluminum drivers featuring coaxial tweeter/midrange; tremendous engineering, build quality and finish; ten-year warranty. Use Easy-to-insert spikes make setup easy; binding posts are underneath speakers; easy to place and get very good results. Value High levels of engineering and craftsmanship have created a reasonably priced speaker that will give you just about everything your system and recordings have to offer. This latest offering from Jim Thiel, placed firmly in the all-important bread-and-butter, sub-$4000 slot in his product line, incorporates his companys latest thinking on time and phase coherency. Aluminum drivers are used, as Thiel believes this material has much greater stiffness and higher compressive strength than conventional diaphragm materials. The 8" long-excursion woofer, which uses a short-coil/long-gap motor system, in combination with a 9" passive radiator produces claimed bass response down to 35Hz. Thiels use of aluminum for the bass driver stems from his belief that its higher compressive strength allows the best transfer of the transient attack to be transmitted. Even more innovative is the new tweeter/midrange coaxial driver -- a 1" tweeter and 4.5" midrange in one. While this concept allows the two drivers to share the same voice coil for better integration, the most fascinating aspect to me is the bonding. The surround of the tweeter, which is connected to the inside of the midrange, is the crossover. The driver is stiff enough so the tweeter moves with the motion of the midrange, but it is also flexible enough to allow the tweeter independent motion above a particular frequency. This also allows the removal of the electrical components of the midrange/tweeter crossover, simplifying the trademark complex Thiel crossover. Having been in manufacturing and engineering all my life, I find this little bit of technology fascinating, and Id love to see this driver being made. Very high-quality components, (polystyrene and polypropylene capacitors; air-core inductors wound with high-purity, low-oxygen copper) round out the first-order crossover. The cabinetry is pure workmanship -- 3"-thick front baffle and 1" side walls, heavy internal bracing, finely matched veneer. One has to just stand around the CS2.3s, which measure 41.5"T x 11"W x 15"D and weigh 70 pounds each, to see how cleanly handsome they are. They offer the audio worlds version of the graceful, angular lines of a Mercedes and the visual fluidity of a Porsche. I feel I would be remiss if I didnt first mention Thiels "corporate character." From the initial communications concerning the CS2.3 to the final unpacking, Thiel simply exuded class. Starting with their tasteful and understated media campaigns, ending with the packaging (shrink-wrapped boxes banded to a palette) and ten-year warranty, one senses there is someone firmly at the controls here. You sense that Thiel cares deeply about their products and their customers. Cable hook-up necessitates laying the speaker on its side to access the bottom-mounted binding posts. While this arrangement is a reviewers nightmare, it does lend itself to a particularly clean look once the cables are installed. The supplied spikes are a new style to me. I feel like shouting this from the rooftops, so I will, I LOVE THIS SPIKING SYSTEM! The spikes are not your standard threaded rod, but rather a ribbed dowel ground to a point that simply fits into a slip-fit insert in the bottom of the enclosure. Although no allowances are made for adjustment, one simply tips the speaker back and slips the spikes in. Sweet! 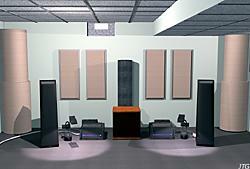 A digital rendering of the Thiel CS2.3 speakers in Jon's listening room. Initial impressions were promising. The CS2.3 was a first for me in that relatively good sound was offered up immediately. It seemed rather indifferent to placement (within reason of course, and post break-in), achieving, it seemed, 80% of maximum performance with a minimum of effort. This bodes well for typical living-room installations that dont afford the space for audiophile setups. In my 25'L x 14.5'W x 7. 5'H room, the CS2.3s were positioned 39" from each side wall (measured from the center top of cabinet) and 45" from the front wall. With the speakers approximately eight feet apart, my listening position was at a ten-foot distance. Toe-in was minimal -- a good deal of the inside of each cabinet was still visible. Listening, or "Hey mister, howd you get that stat in the box?" Transparent, cut-from-the-same-cloth coherent, superb leading-edge transients: think Im referring to an electrostatic? Lets add stunning dynamics (for its size and price) well into the bass, extension in the frequency extremes, and, in my room, decidedly easy placement. The CS2.3 brings to mind a movie-going experience I once had. I was dragged kicking and screaming by my wife to a showing of An American President. Fully expecting a film marketed to the mature female audience, I was fidgeting in my seat as the opening credits rolled. Upon seeing "a Rob Reiner film" appear on screen, I instantly relaxed. Why? Well, whether one likes his films or not, I feel you are guaranteed a finely crafted, professionally presented and entertaining film. One can certainly make the same type of assumption with any of Jim Thiels offerings. When you buy a Thiel, you know you will receive wonderful fit and finish in an aesthetically pleasing package. (I never realized just how handsome these speakers were until they were installed in my room. You wont either.) Along with the cosmetics, Ive never heard a Thiel with anything other than an "accurate" tonal balance. While this voicing can be a double-edged sword, it does imply an open conduit for musical information to flow. Loudspeakers  Alón 4 with Vandersteen 2W-Q subwoofer. Amplifiers  B&K M-200 Sonata monoblocks, Bryston 4B-ST.
Digital  Enlightened Audio Designs T-1000 transport, Camelot Technologies Dragon Pro-2 Mk. I digital processor, Theta DS Pro Gen. III DAC. Interconnects  MIT MI-330 Proline Terminator, MIT MH-330+, Kimber KCAG, van den Hul The First. Speaker cables  MIT MH-750, MIT-MH 750 Plus. Power cords  MIT-Z Cord II, Custom "Andy Man" AC cables. Power conditioner  Audio Power Industries Power Wedge 114. Room treatments  ASC Tower Stouts, Super Traps, Tube Traps, and Flat Traps. Perceived in-room response (via test tones, pink noise and actual music, by golly) was of a very even bass region with a slow rise, beginning in the lower midrange, through the rest of the frequency spectrum. While I found no upper midrange spike, (usually the perception of brightness comes not from the treble, but the upper midrange/lower treble), this response tilt did lead to certain less-than-pristine discs as having a bit too much bite, exacerbating the engineered-in "presence" of nearly all modern popular music discs. This effect was ameliorated somewhat by the particularly grain-free upper midrange and treble. The unique blending of these transducers leads to an electrostatic-like coherency that is breathtaking -- coupled with non-electrostatic-like treble extension and dynamics. Have I just used the D-word to describe a Thiel speaker? You bet I have! In fact, the stunning quickness of these drivers is the CS2.3s strongest trait. Listening to "Brush with the Blues" from the new Jeff Beck CD Who Else! [Sony 67987], I found that the opening guitar intro punches into the room and decays so sweetly that I could have sworn someone sneaked in a Fender Twin Reverb amp (this from a standard pop recording of an electric guitar!). What is, for me, more notable than the unique pairing of the midrange/treble drivers is the resolution and dynamics of the bass system. Jim Thiel has done the seemingly impossible here. The woofer with its passive radiator seems to have the same dynamic "window" of operation as the midrange/treble drivers. Thus, the CS2.3s are extremely punchy and delineated well into the upper bass. Only when descending into the lowest octaves do I hear the passive radiator slightly slowing down the presentation. I think that this mutual dynamic signature is a major factor in the wonderful coherency of the CS2.3. And yes, the CS2.3 does go low. On more than a few occasions I wondered if my subwoofer was left on. Once, while playing some William Orbit, I even had to check. The dynamics and bass response dont come that easily though. When the CS2.3s were first installed, I drove them with some aging B&K M200 mono amplifiers, rated at 200 watts each but certainly not current powerhouses. The performance was certainly presentable, but a relative softness in the bass and a sense of "topping out" in the dynamics left a nagging feeling. Inserting the Bryston 4B-ST amplifier (review in the works) dramatically changed the presentation. Dynamics, coherency and imaging all improved under its control. Make sure you audition this speaker with an amp able to source a goodly amount of current; then you will hear the CS2.3s highest performance. And if you are an electrostatic owner who is frustrated with the inherent limitations of the breed, you need to hear the Thiel CS2.3. You may have just found your dream speaker. One of the greatest dividends that comes with this reviewing gig is testing a product that seems to turn an arduous chore into a lesson in serendipity. Well into the final phase of test, the "play all your high-falootin test cuts" phase, I dug out one of my favorite vocal tests, The Nashville Bluegrass Bands The Boys Are Back in Town [Sugar Hill SH-CD-3778], specifically "Im Rollin Through This Unfriendly World." Not exactly a record to die for, this particular cut has amazed friends, audiophiles and show-going manufacturers alike with its unfettered simplicity of five voices just singin their hearts out. This disc can turn brittle on some systems, particularly in the high harmonies. Time just stopped as this song developed, I tell you. The CS2.3s wonderful microdynamics deliver the human voice in breathtaking detail, with no chestiness (the CS2.3 mated particularly well with my room, producing the smoothest bass response Ive heard in it, ever) and a complete absence of nasality. The CS2.3 responded well to upgrades in the source equipment, showing a seemingly endless amount of resolution. With the addition of the Camelot Dragon digital processor and new MIT MH-750 speaker cables, tonal balance was brought further in line with my personal biases, showing a degree of refinement befitting, well, a Jim Thiel design. Ill have more to say about these cables at another time, but Ill allow one peek: when they were connected to the CS2.3s, the increase in lateral soundstage was not subtle, sufficiently upping the soundstage performance. While not having numerous brands on hand to try, I think I will call this particular combination at least a must-try, if not a must-have. Traditionally a Thiel hallmark, the area of imaging will take some comment. Imaging between the speakers was indeed crafted with laser-like precision. Centrally recorded pianos and acoustic stringed instruments seemed to be both firmly rooted to the stage and float free of any boundaries. 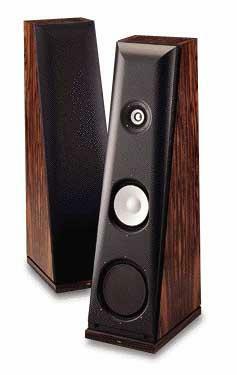 This speaker will give new meaning to the recently coined concept of "edge definition." When driven by the requisite high-current amp, never once could I trip it up with multi-instrument, "busy" recordings to reveal a pastiche-like presentation. The result was always one of several instruments defining their space within ONE boundary. Like I said, coherent. Unfortunately, this one boundary ended at the speaker position. No matter what angle of toe-in or position used, the CS2.3s never seemed to "bloom" outside the physical boundary of the speakers. As with any speaker, one must focus the radiating patterns of the speaker pair. The manufacturers recommended setup is no toe-in. Indeed, the best imaging in my room was obtained with only a slight toe-in with narrower placement than usual. When the speakers were placed too far apart, I localized two "pools" of radiation patterns quite easily. Also, with the pairing of the CS2.3 and the new MIT MH-750 speaker cables, tonal balance was more fully fleshed out and, in particular, more image "bloom" was obtained, although never approaching the "wrap around the head" surround sensation of other speakers Ive had in my room. That said, the product of the CS2.3s awesome resolution is truly palpable image outlines clearly delineated in space. Never better in my room was the sense of listening back into the master tape. The other edge of this sword of resolution is the exposing of ham-fisted production and "sweetening" techniques. Interestingly, I discovered a strange synergy with any Reference Recordings disc. While I have great appreciation for almost the entire RR catalog, the companys discs have always seemed to image differently than any others I play. Obviously, one finds the final speaker position for any given room using as wide a selection of material/recording techniques as possible, then averaging out for the best sound. I obtained the best image bloom when using RR material, any ambient trail or hall bloom reaching, at best, three feet outside the speaker position. Now, this is just an observation, but one repeated many times for visiting audiophiles and a situation certainly warranting a Spockian "interesting." Two potential competitors that I have recent experience with are the Von Schweikert VR-4 and my reference Alón 4. While the VR-4, an accurately balanced speaker that missed my personal mark, and the Alóns go lower in the bass, both are seriously bested by the CS2.3 in resolution and dynamics. I have always found the midrange and treble balance of the Alóns to be just right. However, in the midrange and treble, the CS2.3 showed up both speakers as being relatively cloudy and opaque (especially the VR-4). One would be in great error to say this is just another finely crafted product from Thiel. In some ways, the CS2.3 is an obvious descendant of its predecessors, and in others, a clear beacon indicating the direction in which Thiel is leading the high end. What we have here is a very sanely priced package that delivers near edge-of-the-art resolution and dynamics, seamless coherency, along with extension at the frequency extremes. And this high amount of performance weighs in with very appealing aesthetics and decidedly non-tweaky setup, allowing not just audiophiles but Bob and Jane music lovers the world over access to exalted sound. This, as much as anything about the CS2.3, should be considered a design breakthrough. Do I really have to spell it out? Highly recommended. Price: $3600 per pair in standard finishes; optional finishes available at additional cost. Warranty: Ten years part and labor.